‘What a great name for a blog’, people will say to me. I even meet people at permaculture events who exclaim ‘So you’re the Snail of Happiness’ and I have to confess that I am. I realise, however, that many readers don’t know why I chose the name and that there is also a Snail of Doom (that’s the two of them up at the top of the page) as well as a Worm of Doubt (left). 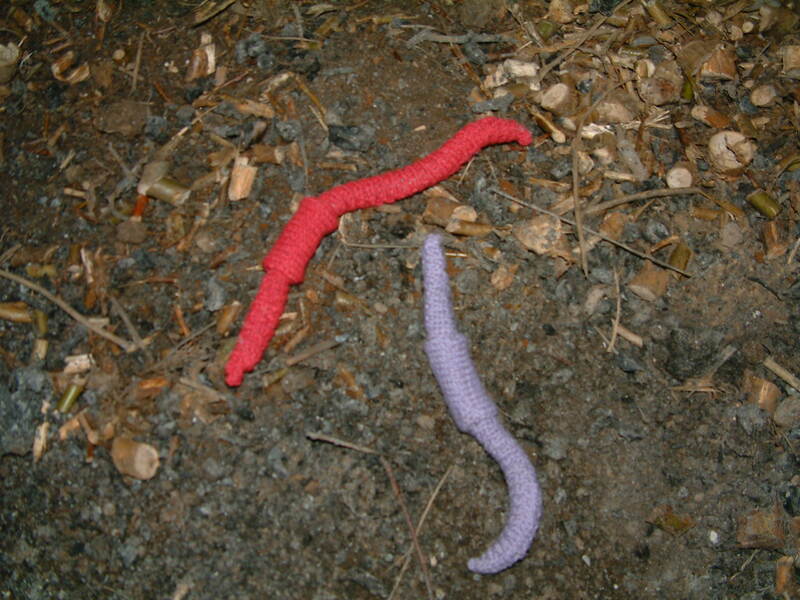 I did blog about the choice of name when I first started out, but I think the story deserves repeating, just so you’re not totally bewildered nor assume that I have a mollusc fetish (although for the knitters amongst you, you might not be surprised to know that my Ravelry name is Mollusca). At the beginning of 2012 I attended a permaculture course (known as the ToT: Teaching of Teachers) to improve my teaching skills. It was focused on teaching permaculture, but was based on ‘Accelerated Learning‘ techniques, which are widely applicable. I do some permaculture teaching, but I do much more on ecology and conservation – either way, I wanted to enhance all my courses. One of the activities was for each of the participants to teach a short session so that we could get feedback on our technique. I’ve been teaching for fifteen years or more, so wanted to do something new rather than simply delivering a session that I’d done before. In order to challenge myself, I chose to address a topic that can be difficult because it leaves those involved feeling rather depressed: I decided to teach a session on ‘spirals of destruction’ i.e. how we get ourselves into a vicious circle of negativity by taking small steps in a negative direction. So as not to leave everybody too gloomy I decided, as well, to get the group to think about ‘spirals of abundance’… getting into a ‘virtuous circle’. Accelerated learning is not a spectator sport – learners all contribute and are actively involved, collaborating with each other in a social setting and constructing their learning in a relevant context. Trying to accommodate all these features, I decided that I would run a group story-telling session. And that it would be good to have some form of ‘talking stick’ to pass round when it was each person’s turn to speak. And thus the idea of the two snails came to me… the snail of happiness for our positive spiral and the snail of doom for our negative spiral, supported by the worm of doubt, who got thrown over my shoulder at the end of the session. To make the session relevant to the context, I started the story with there being two weeks to go before I had to do my teaching session on the course and not knowing what to do. I passed the snail of doom on to the next person, who told the next (negative step) in the story. We worked our way round the group, moving from ‘I couldn’t think what to do, so I didn’t bother’ to ‘there was only a week to go, I still hadn’t done anything’ to ‘so I had a drink’ to ‘and another drink’ and eventually to ‘and here I am in the session and I still haven’t got any ideas, but I do have a hangover’! We then started from the same origin, but using the snail of happiness and describing positive steps and ending with a successful session (in the story and in reality). It’s a simple way to illustrate a point – getting everyone to engage with a story – but it works. In order to run this session, I had to make the snails (two snails that are tactile and mirror images of each other turned out to be impossible to source) and that was when I discovered the art of amigurumi (knitted or crocheted critters). Once made, the snails rather took on a life of their own and I loved the idea of the snail of happiness so much that I used the name for this blog… it seems to be strangely memorable and is, therefore, also the name I have chosen for my etsy shop (coming soon – promise). So, there you are, that’s the story! 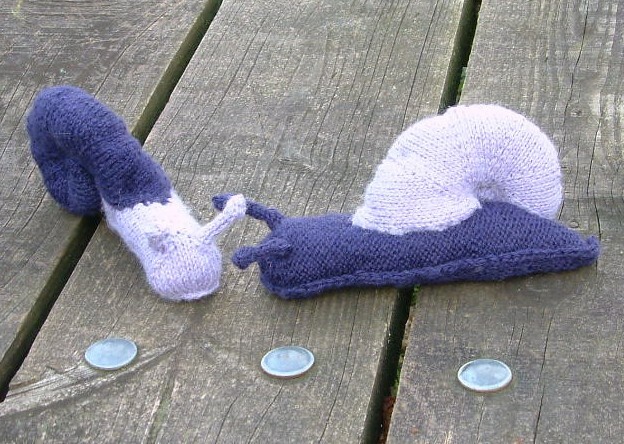 And if you need a knitted snail, just let me know!